← Everything Royal is now ‘The Talk of the World” We Have A Shuffler Connection As Well!!! Nick Radmanovich and Walter Chadwick were among those playing shuffleboard on the opening day. There’s regular sessions at the SOTB and instruction is available for those interested in learning how to play. Alberta 55+ Sports: The floor shuffleboard season has now opened at the Seniors on The Bow (SOTB). Organizer Doug Campbell says weekly Tuesday drop-in sessions are now underway starting at 1:15 p.m. at the SOTB, located upstairs in the Spray Lake Sawmills Family Sports Centre and coincides with lawn bowling. There’s plenty of veterans of the game on hand to assist those wanting to give it a try or get some refresher tips. Floor shuffleboard is played by teams of two. Teams will be equalled out during the sessions. Play will continue through May and into late July when the centre closes for a few weeks. Also known as deck shuffleboard, players use cues to push discs down a narrow alley. At the end is a number of scoring areas. It’s been played in Europe for over 500 years. 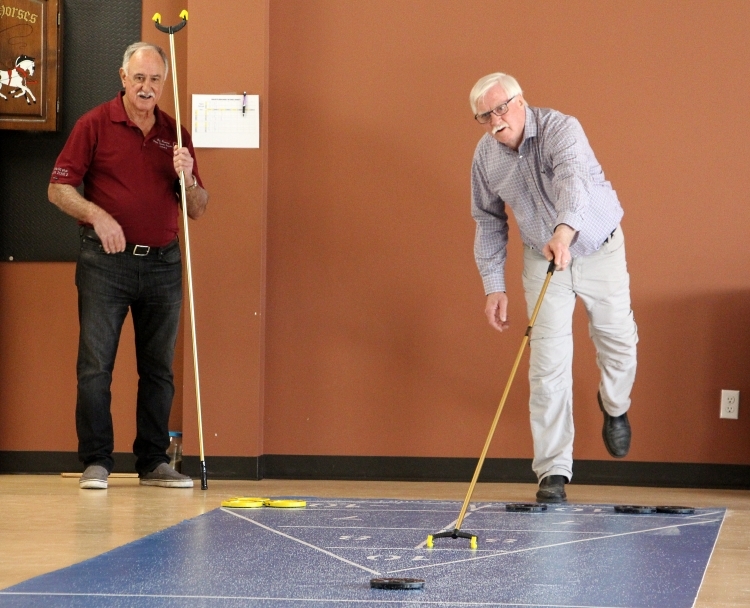 For the Big Country Zone of Alberta 55+ Sports, Campbell is currently lining up a pickleball tournament on July 28 he hopes will evolve into a sports day that also includes floor shuffleboard, carpet bowling, bocce and horseshoes. Details are currently being hammered out and expect to hear more soon.